Another rainy start today, but we had SeaWorld pencilled in for today and didn’t want to waste [another] day like we did yesterday. So paonchos were added to the backpack, and we set off for SeaWorld! Stopping at McDonalds on the way for breakfast on the go, Liam had a bacon muffin and I had a sausage and egg biscuit. Steve didn’t fancy anything so early in the morning! I felt like we had to visit McDs at least once whilst in America to “see what it’s like” and because my dad refused to let me go into a McDonalds when I went to Texas with him in 1994! He said they’re the same the world over…no they’re not!! We don’t have biscuits for breakfast on the UK MickyD’s menu! My biscuit breakfast was very salty…seems to be the recurring theme with American food! 7-eleven was next door, so we popped in there to take some cash out with our Citibank card (it’s free to withdraw from 7-eleven) and we were on our way…again! The rain had an effect on the traffic, which, according to my diary was a slow crawl, but eventually, of course, we got to SeaWorld. Rain was pouring, so ponchos were donned and we parked right next to the entrance to the park…I was surprised, as by now it was about 10am and I was expecting the place to be busy – perhaps the rain was keeping everyone away? Anyway, e-tickets scanned, and we were in! A quick photo of Shamu (we didn’t bother to wait in line – we had shows to see!) and then we made a reservation for Shark’s Underwater Grill for 5pm at the service desk as you walk into the park. We hoped that it would be better than the rather disappointing (for us) Mythos. We grabbed park maps – which annoyingly at SeaWorld (and Busch Gardens) are huge A3 sized affairs, which you have to fold up yourself (not pre-folded) and have to swap from back to front to see show times and then where they are situated on the map…I personally didn’t find them user friendly! SeaWorld was definitely one of the parks we were really looking forward to, so with the map surveyed, our plan of action was to ‘watch ALL the shows’, starting with One Ocean at Shamu Stadium at 11:30am. Shoudda gone to Specsavers methinks! Carrying on with our walk around the very quiet park, we saw some dolphins in the dolphin nursery pool, and I got excited at the thought of our swim with the dolphins at Discovery Cove. Taking note of the only time for Shamu Rocks in the evening, we followed the sign and eventually arrived at Shamu Stadium. We walked straight in, no lines, barely any one there. We chose not to sit in the splash zone, but sat a few rows back from it. Scanning the show times on the back of the map, I started circling the times of the shows to fit in as much as we possibly could. Deciding what to we were going to do for the day passed the time as we waited for the show to start. When the show started, we were all in awe. I remember the killer whale and dolphin shows at Windsor Safari Park when I was a kid, and watching Shamu and his friends really took me back to my childhood. The music was wonderful and the interaction between the trainers and the whales was amazing – I didn’t even notice that they didn’t go into the water with them. When the star of the show, Shamu, came out, there was a huge build up to his appearance and a big cheer as well! And when he launches himself on top of the platform, you realise just how big he is! A final leap from the whales and a thunderous applause from the audience brought the show to an end, and I have to admit to wiping a few tears from my eyes – music always gets to me, and the music for this was just lovely. Up next was the 12:45 showing of Clyde & Seamore Take Pirate Island at the Sealion and Otter Stadium. Along the way we walked through Shamu’s Happy Harbour. We walked through the Sea Garden to meet some of the birds as part of the animal encounters that they have there. We spotted Sharks Underwater Grill – Liam said he would like to see the sharks, but I said we would be back this way later for dinner and he would be able to see them then. Eventually we found the stadium for the show – we were quite late in arriving for this, so we were sat up quite high; it didn’t spoil anything though and it was a very funny and entertaining show. …and Manta along the way. With me wishing I could go on it, but knew it would be a no-go for me size wise, I asked Steve if he wanted to have a go…but he declined!! It looks super awesome!! We really struggled to find the Seaport Theatre – I don’t know why – we knew it was near Manta, but couldn’t seem to get our bearings at all. we did find it in the end, and went into the lovely, air-conned auditorium. The Pets Ahoy show was very, very good. It made us laugh so much and we all marvelled at how well trained the [rescued] animals were. It also made us miss our cat, Pumpkin, especially when we could pet the animals at the end of the show. By now, the sun had made an appearance, and after a squirt of sun cream and a drink break, we were off toward the Whale & Dolphin Theatre for Blue Horizons. Now this show was simply breathtaking. I would happily go and watch it again and again. Amazing. With the trainers, the story unfolding, the dolphins, false killer whales (as informed by my son), the birds, (what is that huge bird that flies across? It thought it might have been a condor – does anyone know? 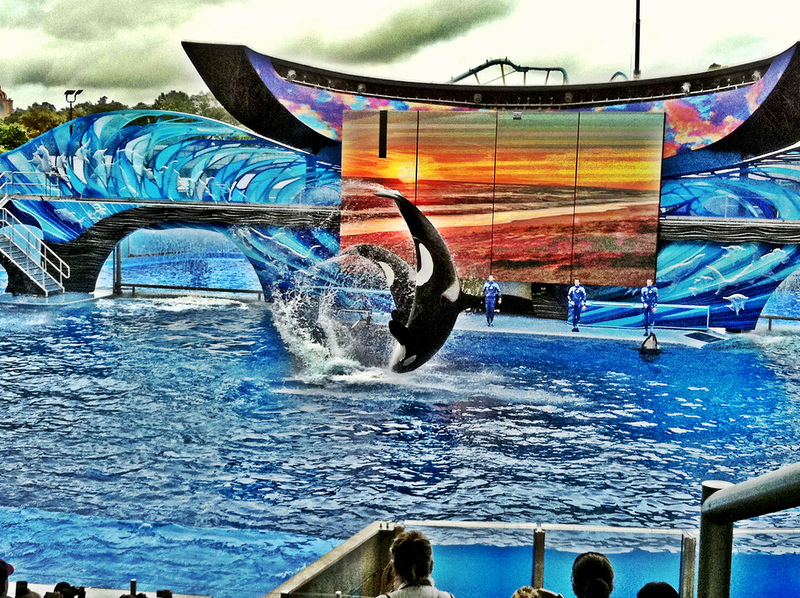 ), the acrobatics and high-dives…all were very impressive and if you only watch one show at SeaWorld, make it this one! We didn’t have too long now till our reservation at Shark’s Underwater Grill, so we walked around the back of the Whale & Dolphin Theatre to view all the exhibits -Manatee Rescue, Alligators, Garden of Discovery, Dolphin Cove, Stingray Lagoon and Turtle Point. We passed through the penguin encounter and it made me wish we had booked the Penguin Up Close Tour – I ♥ penguins! We got to our reservation a little early, so went through the Shark Encounter, promising Liam we’ll go after dinner to feed them as he had requested. After seeing the sharks we went into the restaurant and were seated right away. It was a lovely restaurant, very dim lighting and very tranquil with the aquarium all around you. We were given a booth at the back and had a great view of the tank and it was awesome to watch the fish and sharks swimming around. We were presented with the menu, and after reeling in shock at the prices, we decided what to order. I had the shrimp cocktail ($9.50) which was ‘just’ 4 king prawns on a bed of lettuce with Marie Rose sauce on the side for dipping – succulent prawns, and not the 70s prawn cocktail I was expecting like we get in the UK! Steve had the stuffed mushroom trio ($8.00). I can’t remember now what they were stuff with – I think one was cheese. They all sat on top of crostini. He enjoyed his starter. Now, whilst I reel in shock again at the price of the filet mignon surf and turf that I had ($34), let me tell you, it was the most amazing piece of steak I have ever eaten in my life! (and I’ve grown up living in restaurants as my dad was a publican). It was cooked to perfection (if your perfection is medium rare) and completely melt in the mouth. It was accompanied by a skewer of shrimp, garlic mash and asparagus – but all this paled in comparison! Steve opted for the blackened seafood trio of shrimp, scallops and salmon (or was it crab? cakes. $25). The little bundle of yellow cloth that you can see is actually half a lemon to squeeze on your seafood. I thought it was clever to wrap it in muslin to catch the pips! It was served with a coleslaw type salad which was very tasty – as was all the meal which Steve has commented about over my shoulder as I type this! There wasn’t a great choice for kids, and Liam ended up having hot dog with fries ($9). (No photo of that for once!) I felt quite sorry for him. If you don’t like mac ‘n’ cheese, your screwed with the kids menus in the USA! But, he did make up for it by pretty much eating all the dessert we ordered to share – the brownie shark ($8). I also had a cappuccino which brought our total bill to a whopping $109.89, plus tip. BUT, it didn’t cost as much as the abysmal (in the future) Hollywood & Vine meal we had at Hollywood Studios. We would gladly pay that again for a meal at Shark’s Underwater Grill. As I said, there isn’t much for kids – and if you have fussy kids, even less so. Other than that, everything about this experience was wonderful – the surroundings, our waitress (who was ours for the whole service) and the food. Definitely a restaurant to pay a visit to, in our opinion. By the time we came out of the restaurant, we discovered that the shark feeing time was over, and Liam was very disappointed. I felt so bad as I hadn’t noticed a time limit for it :( We then walked off our dinner around the park for a bit and then joined the queue for Journey to Atlantis. It was a 50 minute wait – although it seemed a hell of a lot longer…but the ride more than made up for the waiting time…it was wicked! I think we got more wet from the splash on the second small drop than on the first big drop! Part coaster, part log flume – a great ride! We would have done it again had the queue not been so long. Plus size ride guide: lap bar, enough room for me! Shamu Rocks was on at 8:30. We figured it would be very popular and wanted to get there in enough time to get a seat, so after riding Journey to Atlantis, we made our way back over to Shamu Stadium. I am so glad we did, as a hefty queue started to build up behind us. Whilst we waited, Steve bought a drink and pretzel in the shape of Shamu…it was dry and over salty and horrid! We chucked it after one bite! Whilst waiting patiently to be allowed into the stadium, we encountered some pushing in, which didn’t please us or the other Brits around us, and I said, quite loudly, “obviously, people have no manners if they think that pushing in is okay whilst others have been waiting in line”, but it fell on deaf ears. It didn’t matter really, I suppose, as there was plenty of room – but I hate pusher-inners! We decided this time to sit in the splash zone – we sat in row 12. Splash zone we were sat; splashed we were not! I was gutted as it would have been cool to get drenched! But also because I didn’t take any photos for fear of my iPhone getting wet and broked! Shamu & Co. at night was just as awesome, if not more so, and being that much closer to the front, I was in even more awe at the sheer size of that famous whale! I don’t have many photos from this as Steve video’d it on our waterproof camera instead. Here are the videos he took. This particular video just makes me weepy, one, because it reminds me how fantastic our holiday to Orlando was, and two, because the track – The Animal Song is by one of my favourite bands, Savage Garden. And this photo, Steve took on the same camera. I’m pretty sure you can hear a lot of ‘wows’ and ‘woos’ of delight from us every time a whale leapt into the air! Liam love it, Steve loved it and I loved it. I know it’s not everyone’s cup of tea, but it was the brew for us – amazing show! Shamu Rocks was only on for a few more nights so I am glad that we got to see it. Everyone piled out of the stadium and headed towards Atlantis Bay Stadium for ‘Reflections’. We decided against staying for it (for some reason that escapes me now) and walked in the direction of the exit to find that the path was closed off – not sure why. This forced us to walk all the way back around the park to find our way out. We stopped along the way for a Shamu Sundae – which for some reason, I don’t have a photo of, so you’ll have to make do with sprinkles! We also bough some gifts – I couldn’t visit SeaWorld and not come out without a plushie Shamu! We also pressed some pennies, which we loved collecting throughout our trip. Asking for an indication of the way out, because it felt like we had been walking forever, we finally reached the exit. It was a LONG way around! If there was a quicker way, we didn’t find it!! If there is one thing I will moan about SeaWorld, is that whilst there are signs, they just don’t seem to help that much! We got muddled several times trying to find things…or maybe we just can’t follow signs!! It was quick and painless to get out of the car park, and I think, all in all we did everything we wanted to do. We unfortunately missed the Sealions Tonite show because of the time clash with Shamu Rocks. In hindsight, I wish we had made the effort to go back to SeaWorld one evening to see that show..hindsight is a wonderful thing though, and it will help us with our next trip to Florida in 2013! As I’ve typed this out, it really feels like we didn’t do much at this park, but we were there all day long! Although for us, it was more of a shows/exhibits park, rather than rides. I think wanting to get to see the shows and walking from stadium to stadium took up a lot of time. I’m glad we took some time in the morning to plan out our day. I think, if you factor in the two big coasters as well, it might be a push to do it all comfortably in a day, but it is probably do-able. Two days I think would be better so you don’t feel so rushed. All in all, SeaWorld was brilliant and we loved every minute of this day! Tomorrow…new car and our 1st Disney theme park!